Anise seed is one of my favourite seasonings for chicken. roast chicken is just not the same without it. to the anise seed for a new flavour twist on the barbecue. 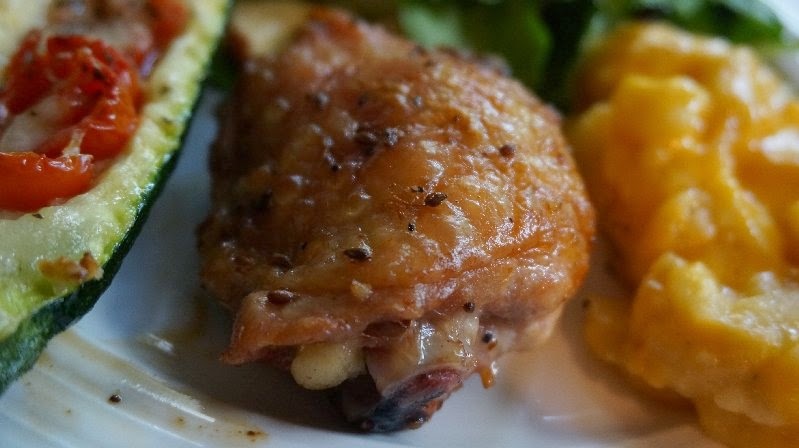 Wash chicken thighs and blot dry with paper towel. Brush on all sides of chicken. Place over medium heat on barbecue. Grill until meat is cooked through. This sounds delicious Bev, thanks for the idea. We also love anise. Anise seed and Star anise are actually two different spices. if you have ground anise, it might be ground Star Anise. Both have a mild licorice flavour but Anise seed is less bitter and a bit sweeter than the big Star Aniseed that we recognize as a rusty brown star with eight tips and each tip contains a shiny amber seed. Anise seeds are small oval brown seeds ... almost like a caraway seed shape. Bev's recipes is calling for the Anise seeds. Oh - that sounds delicious! I love anise and never thought of using it on chicken! Yum! Sounds delicious! How long do you estimate the cooking time to be? Thanks. Cooking time will depend on your grill and the weight of your chicken pieces. I'm thinking these bone in pieces would have taken about 1/2 hour. Boneless will take less time. What a unique idea/recipe. I can't wait to try it as I love the anise flavor. Thank you for explaining the different types and uses.